Tenku Bakudanyaki brings to Richmond a very innovative offering from Japan. 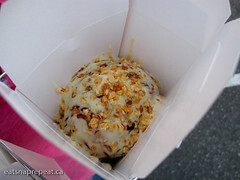 Super sized takoyaki. Or literally translated from the name, grilled bombs. 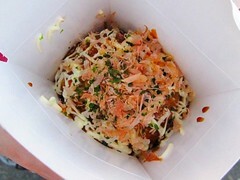 Served hot off of the back of a mobile kitchen, these tennis ball sized spheres contain almost a dozen different ingredients (squid, cabbage, shrimp, mochi, shrimp, …), and are covered in okonomiyaki sauce, Japanese mayo, and a variety of toppings. We had a hard time finding their truck because we just didn’t expect it to be smack in the middle of a parking lot on the southeast corner of Elmbridge and Gilbert. 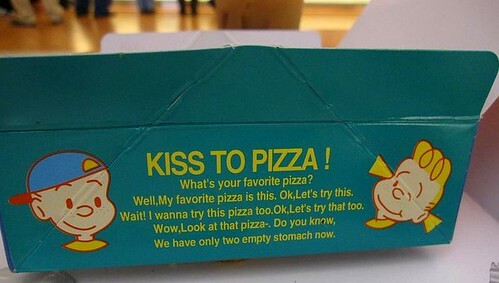 There’s a good variety of flavors served in that small take out box. 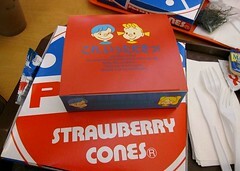 Because of the large number of ingredients, every bite is kept interesting. 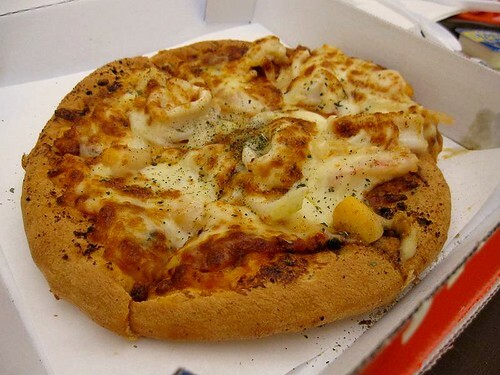 One’s not enough for a meal, but luckily Aberdeen is just minutes away. P.S. The owner said he has plans to expand to several locations. I hope he meant outside of Richmond. They’re already on twitter @Bakudanyaki (and a lot less annoying than @Japadog). P.P.S. 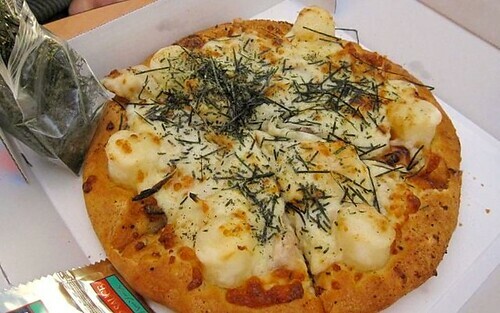 There are a few bakudanyaki chains in Japan. If you’re wondering what they’re like, check out here, here, and here. 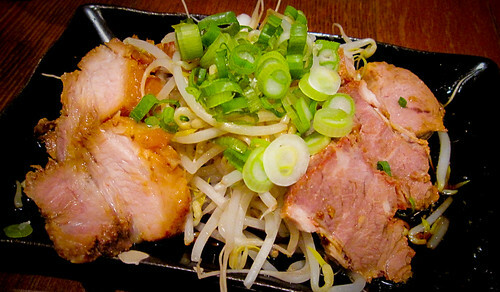 Kintaro is the Vancouver standard for ramen. Ruling the egg noodle in rich broth kingdom with one hot cousin by its side. If you had the bonitos to challenge that authority by opening up another ramen shop on the same street block, what might you do to avoid a quick and shameful death? 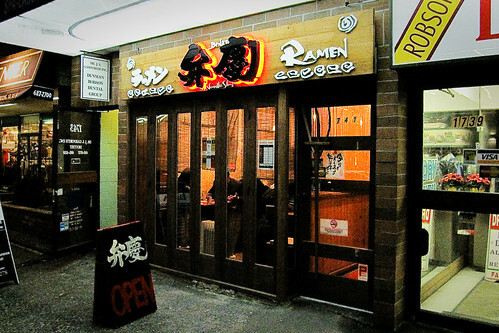 With a brightly lit facade, dressed up decor, adequate seating (not comfortable, just adequate), and no line of hungry customers spilling onto the sidewalk on a Friday night, its more welcoming than the royal ramen family around the corner. All of that is simply plate garnish however, as what really matters is the food. 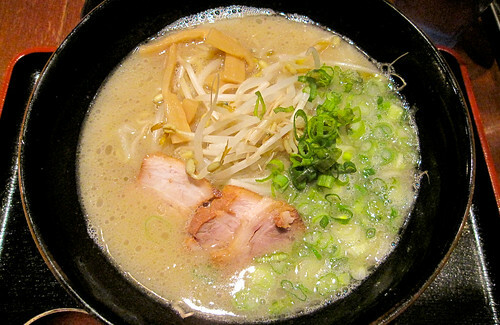 Their Shio “heavy tonkotsu” ramen is advertised to be popular with the ladies. Though I think it’ll appeal to anyone who’s looking for a rich and very meaty tasting broth that suspends a lot of flavor around slippery noodles. We also had the Miso ramen, which in my opinion is even heavier than the Shio tonkotsu soup with a quarter inch of clear oil floating at the top of the bowl. Combined with the extra salty miso, any depth of flavor (if there were much) were covered up. Also, the portions were a bit smaller than Kintaro’s. A good hearty meal, but Benkei still doesn’t beat out Kintaro or Motomachi Shokudo for ramen. It does offer some healthy competition that ensures everyone is playing their A game, which I hope someday will spread beyond the Robson & Denman block. 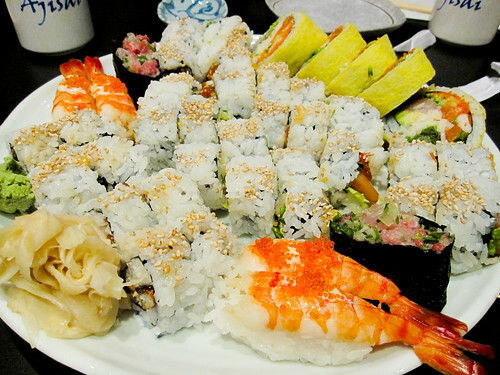 I had high expectations when visiting Ajisai Sushi in Kerrisdale due to the number of rave reviews and acclamations on the intarwebs over the freshness of their ingredients and authentic preparation methods. 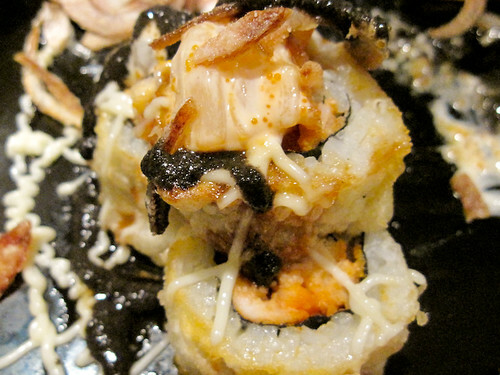 It consists of their spicy sushi combo, ebi mayo (shrimp with a dabble of Japanese mayo on top. Not what I expected at $1.90/piece), futomaki, negi hama (yellowtail), and a roll with taro and bbq eel in it. Not pictured is their BBQ black cod. A slice that took over half hour to get to our table. It was the most decadent and buttered up piece of fish I’ve ever tasted. The bill was quite reasonable because we had little of their flown in from across the pacific ocean exotica. It may be unrealistic expectations, or that the items we ordered didn’t contain enough raw fish to make the freshness factor stand out, but I’ve had plenty of sushi from places that weren’t hyped for purveying exceptionally fresh ingredients, yet still manages to impress a casual sushi eater such as myself. Ajisai Sushi is not a bad restaurant, and very well may have great appeal for the aficionados and gurus looking for the freshest pieces of raw fish. It just wasn’t a gem for me. 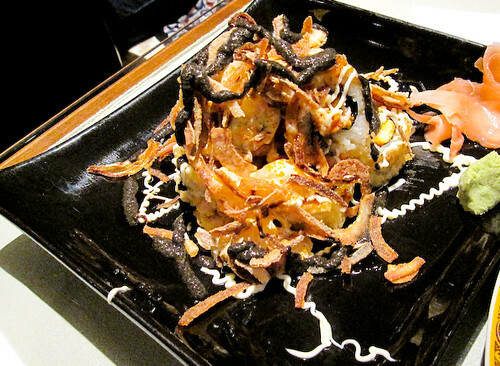 The idea of fried chopped scallop sushi may be strange, but when layered with Japanese mayo, sesame paste, and deep fried onions, one bite and it all starts to make sense. This was the only fun sushi concoction I ordered on this visit, but the food’s satisfying enough that Makoto will soon become one of my regular casual dinner spots.